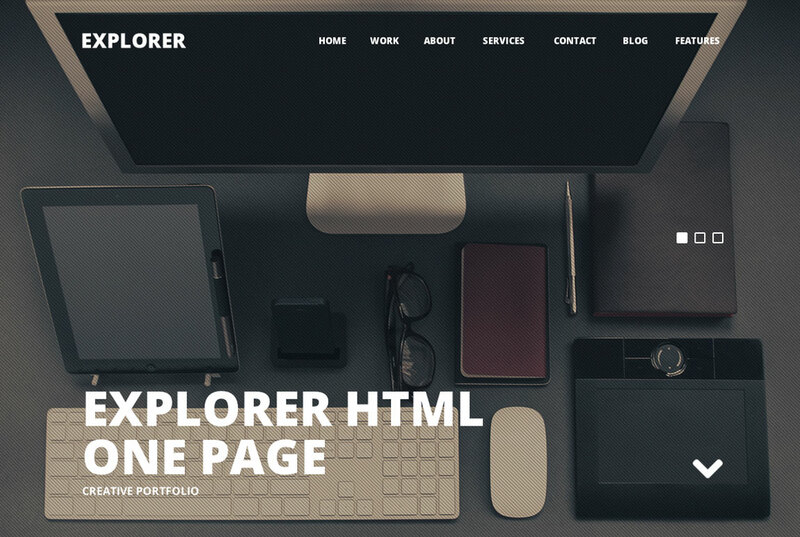 ‘Explorer’ is a $13 One Page HTML template from UK based themers, Code Blvck. Main features include parallax scrolling, two intro section variations (slideshow/static), Isotope Filtered portfolio and a Twitter feed. Explorer is a beautiful multipurpose one page parallax template perfectly tailored for agency and portfolio showcase. Explorer Comes in two versions of slideshow front and static front with loads of customization options and ease of use. Explorer guarantees a unique website every time whether its for you or your client. Feature list includes W3C Valid, Responsive, Retina Ready, Interactive, Ajax Portfolio, Smooth Scroll, Isotope Filter, Fullscreen Slideshow, Parallax, Masonry, Custom Colors, Custom Backgrounds, Working Contact Form, Blog Templates, Tons Of Shortcodes, Twitter, Flexislider, Supersized Slideshow, Unique Clean And Modern, Font Awesome, Html5 Mockup Devices and much more.